What are typical pediatric eye emergencies? Eyes and their surrounding skin are some of the most delicate organs in the body. Many classic sports moves put children’s eyes in the line of danger, such as whizzing balls, shooting darts, and swinging bats or rackets. Even peaceful recreation, such as lying by the poolside or on the beach, can lead to eye irritation from sand or burns from overexposure to strong sunrays. Diving into the waves or slipping and sliding at a waterpark are a fantastic and fun way to cool off. However, wet and wild action can also lead to eye infection from chemicals, or eye injury from crashing into a stray elbow poking out. How do I know if my kid has an eye emergency? Every parent has faced the confusing question how bad is it? Kids come home with scrapes and bruises all the time, especially in the summer. You don’t want to overreact with a mad dash to the emergency room, yet you also don’t want to ignore a potentially serious medical problem. Without attention from a qualified eye doctor, some types of eye injury and eye infection can lead to vision loss and future complications. Even if you are unaware of any trauma or injury that occurred, the above symptoms are all red flags to be taken seriously! Call our eye doctor for urgent assistance. It often feels like there is a magnetic attraction between balls, bats, sticks, stones and children’s eyes! A direct hit to the eye or face can cause a black eye – basically a bruise from bleeding under the skin. The best thing you can do is gently apply cold compresses to your kid’s eye (with no pressure) as soon as possible. Then contact us for medical assistance. 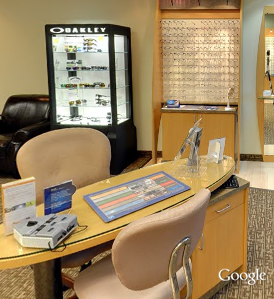 Our eye doctor will check for any vision damage. Applying sunscreen to the face can be tricky, and generous amounts will easily smear into your child’s eyes. Hours spent in a heavily chlorinated pool or ducking waves at the beach can also lead to red, irritated eyes. In addition, the camp arts and crafts room can be another source of potentially hazardous substances, such as paint thinner and fixative sprays. If your child gets any of these chemicals in his or her eyes, rinse the eye/s out immediately with clean, cool water. Hold the eyelid open under a sink faucet for about 15 minutes. (If you need to rinse both eyes, a shower works best.) Afterwards, call our optometrist for guidance on how to proceed – we’ll need to know exactly what solution contacted the eye. If you’re dealing with a tiny object, such as a stray eyelash or grain of sand, the eye will typically handle it naturally through blinking and tears. When you need to provide help, the best thing to do is wash your hands and inspect your kid’s eyes. If you see the object, flush it out with clean water. If you cannot see the offending item, contact our office to bring your child in for urgent treatment. Our eye doctor is qualified and experienced to remove foreign objects. However, if the object (such as a wood shaving from carpentry workshop) appears to have penetrated the surface of your child’s eyes, do not attempt to remove it! Only a professional who is trained in emergency eye care should remove the foreign body. Seek medical attention immediately, as a delay can lead to complications or vision loss. Focus on Safe Summer Sight! When school is out and so are your kids! Summer brings a long stretch of days spent outdoors, and many children spend this vacation running (or biking!) between the pool, beach, sports field or game court. Fun in the sun is healthy and productive, yet it’s wise to also play it safe. As your kid-friendly optometrists, we provide emergency eye care for many children each summer. While eye injury and eye infection may be common for kids who are physically active, there are various ways to lower their risk and prevent many summer eye emergencies. Rule no. 1: with all types of eye injury or infection, it’s critical to tell your kids not to rub their eyes! Rubbing eyes can spread the harmful substance, inflame already irritated eyes, and make every condition worse. How can you help keep your kids safe from eye emergencies? Our best advice is to equip your child with protective eye gear. When you get ready for the summer or pack your child for camp, visit our office to stock up on quality goggles, sunglasses, and all types of safety eyewear!